About 300 million years ago during the Permian Period, the continents drifted together forming a single supercontinent called Pangaea. After 100 million years at the very end of the Triassic Period, Pangaea started to break up. One of the cracks in Pangaea ran up what is now the East Coast of North America. That crack eventually opened to become the modern Atlantic Ocean. 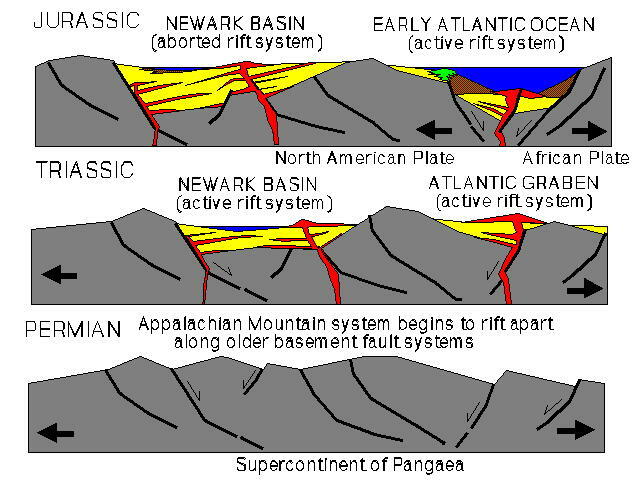 Deposits from the rift valleys that formed the floor of the pre-Atlantic rip through Pangaea are found today in basins along the East Coast of the US. I have termed them the Triassic Basins Terrane. 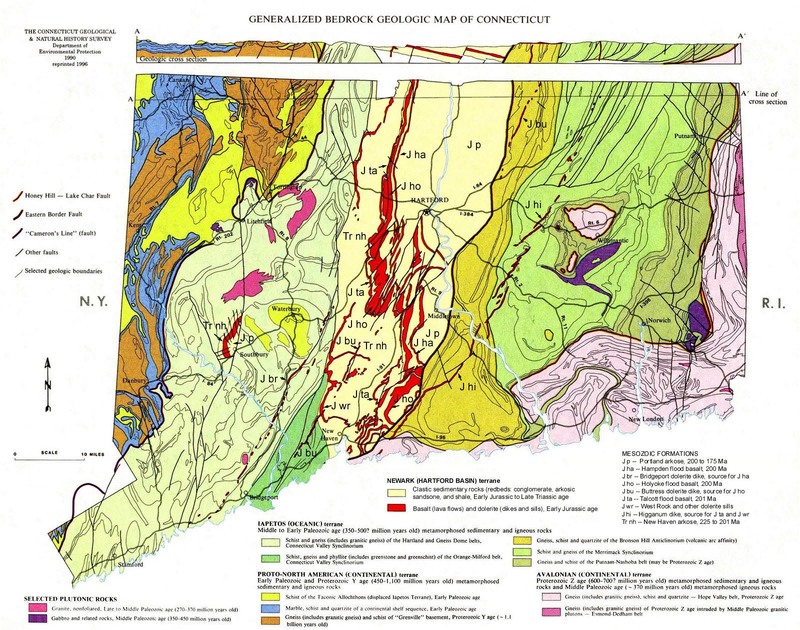 Although Triassic basins extend South to the Carolinas, two of the most studied sets of outcrops are in the valley of the Connecticut River and in Northern New Jersey. These are usually referred to collectively as the Newark Supergroup although different basins tend to have individual formations with different names. The younger parts of the Newark Supergroup are Jurassic. The ancient Iapetus and Rheas Seas closed during the mid and late Paleozoic welding North America (Laurentia) and Africa (Gondwana) together with a thin strip of continental material (Avalonia) sandwiched between. 100 million years later at the end of the Triassic Period a rift presumably similar to the modern East African rift opened down in the part of Pangaea between the ancient continents of Laurentia and Gondwana. This rift -- which may have been as much as 100km wide -- eventually opened to form the modern Atlantic Ocean. The exact sequence of events is still somewhat opaque. The Triassic basins may predate the actual start of Atlantic opening by several tens of millions of years. (Poorly understood Jurassic rocks found subsurface in central Michigan might be related). In Nova Scotia, the Triassic and Jurassic beds are in sequence atop relatively unaltered late Paleozoic sediments. Elsewhere, the Triassic beds lie atop altered Iapetus sea bottom rocks of the Iapetus sea bottom terrane. The rocks of the Triassic basins consist of lava flows many tens of meters thick interbedded with river (fluvial) lakebed (lacustrine) and valley floor deposits. The primary rock types are lavas that are usually red stained on weathered surfaces, red sandstones, and occasional black shales. Those basins that are well understood are 'half-grabens' terminating on one side in a major fault that quite likely dates back to the original deposition. The basins have subsequently been tilted and the high side eroded flat. A few conglomerate beds are found near fault zones that are thought to be the original walls of the rift valleys. The climate at the time these basins were created exhibited periodic wetter and drier periods. It appears that the climate overall was more arid in the North and more humid further South. Beds are thinner in the North indicating less sedimentation. There are coal beds -- some thick enough for commercial exploitation -- in Virginia and North Carolina. Further North, plant remains are limited to impressions in shales and sandstones. Total thickness of the Triassic-Jurassic rocks may be as much as 10km. Many authors believe that the exposed outcrops represent failed rift systems mostly (except along the Connecticut River) parallel to the eventual successful mid-Atlantic fault to the East. The lava flows in the various basins are thought not to be associated across the basins. Long term (100 century more or less) Von Houten cycles of drier and wetter weather during deposition are represented in the Triassic-Jurassic sediments by cyclic deposits of sandstone and shale representing varying depths of the lake water. Average deposition appears to be less than a mm per year. Fossils are all terrestrial although a few specimens of the fish Ptycholepis that is thought to be exclusively marine in European deposits do occur at one level in several of the basins. In the sandstones and shales fossils include often diverse plant fragments, a few mollusks, insects, and crustacea, some coprolites, a very few reptile bones, fish, and a great many footprints -- mostly from a number of genera of dinosaurs. The fossils have aroused considerable scientific interest in recent decades because they represent a precisely datable faunal and floral sequence from the interior of the Pangean supercontinent that was continuously deposited across the Triassic-Jurassic boundary. These beds are quite distinctive and resemble nothing in the surrounding rocks. They were originally termed the 'New Red Sandstone' -- the term used for similar rocks in Northern Europe. Later, they came to be called the 'Newark Group' or 'Newark Supergroup'. Some authors still use the Newark label. Others prefer to use specific formation nomenclature. Some beds in the Triassic Basins are said to contain fairly abundant fossils. But the combination of the basins largely lying in densely populated areas and the substantial commercial value of dinosaur footprints and fish fossils greatly limits the potential for recreational collecting. There probably are locations accessible for collecting, but they will require local knowledge as well as some judgment about access, when to stick to photography, and what can be taken home without causing problems. Amherst College Natural History Museum, Amherst, MA (This is presumably the Pratt Museum said to have the largest collection of dinosaur footprints in the world).